In many ways, Quanser is in the midst of an epic business challenge as we systematically transition from our hard-earned reputation as the company with the best open-architecture control system plants, to the company delivering effective, practical technology solutions for a broad range of critical problems in modern engineering education and research. Last week at the American Society of Engineering Education (ASEE) annual conference in San Antonio, Texas, the company debuted its new generation of solution concepts built on our core technology platform and generated a lot of buzz in a typically, well-behaved conference. Business folks will use the term “Crossing the Chasm” in reference to the challenges that technology companies face as they strive to grow from a small company surviving on the vision of “early adopters” who intuitively understand the benefit and value of a new technology, to a large diversified company that has figured out how to transform a unique new technology to a more richer offering that appeals to a broader audience – “the majority”. Companies who successfully do this cross the proverbial chasm. The reality is most small technology companies fail to do this and indeed they crash and burn in that same chasm. 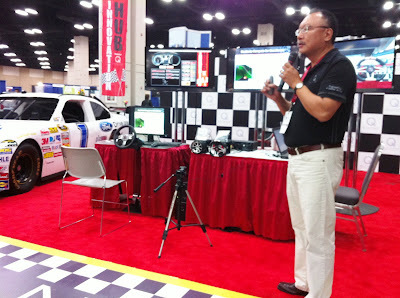 Dr. Tom Lee, Quanser's Chief Education Officer addresses the audience at the Quasner Innovation Hub and outlines the pedagogy and technology behind the Quanser Driving Simulator. 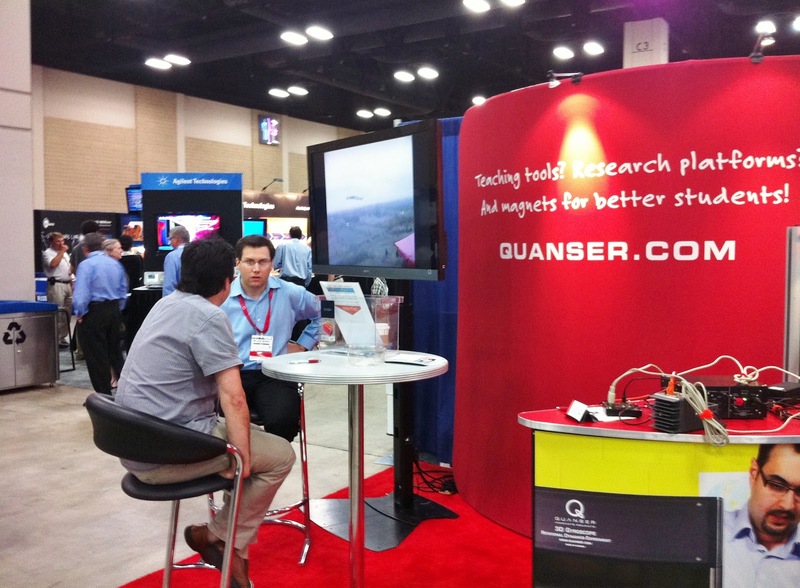 Prior to joining Quanser last year, I had seen the Quanser exhibits at previous ASEE conferences and, in general, was impressed by the overall creativity and richness of the presentation. But definitely, this year, our presence was markedly different in both tone and impact. Quanser had two primary exhibits. The first was the big red display that usually adorns the conferences we attend. But the most memorable exhibit was the Quanser Innovation Hub: a large theater area highlighting the creative application of new technology to enhance engineering education. This year, Quanser focused on the Quanser Driving Simulator (QDS) that mapped an exciting race car simulation experience to a rigorous Hardware In the Loop (HIL) framework using Quanser hardware and software and LabVIEW™ software from National Instruments. As a conference attendee puts the QDS through its paces, Quanser's Derry Cyrmble outlines her real-time progress with engaging Hardware-in-the-Loop race car simulation. The audience was presented with an overview of the pedagogy and technology of the system and then was invited to take a test drive, which challenged their driving ability (the fun part) and their engineering intuition (the rigorous part). The drivers with the best lap times at the end of the conference were rewarded with gifts and the eternal adoration of their peers! You couldn’t miss the spectacle. It was one of the largest displays at the conference. It had a genuine NASCAR racing car as a part of the display, and every square inch was decorated to support the theme of an exciting autorace. The visuals notwithstanding, the most impressive quality of the Innovation Hub was audience engagement. As expected, the audience enjoyed both the thought-provoking formal presentation and the hands-on competition. What we didn’t expect was the raw emotional response of many individuals who really took the challenge to heart. There were many who returned to the display to take a second, or third drive. Some dragged their colleagues to the Hub, not only take a test drive, but to show them the rich education potential of the system. Many kept popping back in simply to check the emerging lap times to ensure that they were still competitive. In the end a young student won the grand prize. But he didn’t win because he was a video game wizard with years spent in his teen-cave in his parents’ basement, honing his game control skills. 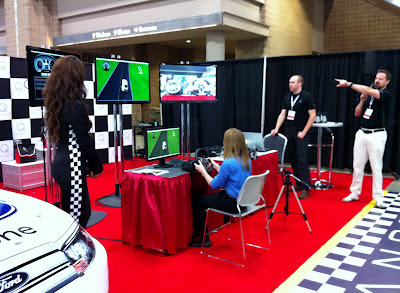 He won because he augmented his natural gaming skills with real engineering insight by manually tuning the vehicle dynamics parameters to give him a competitive edge. Yes, this was not only legal but encouraged. When he noticed that others were catching up, he pestered Quanser resident automotive simulation expert Peter Martin on the meaning and influence of the core engineering parameters… in other words, he used engineering concepts to win in a competitive situation. We couldn’t have asked for a better validation of the educational principles of the QDS. 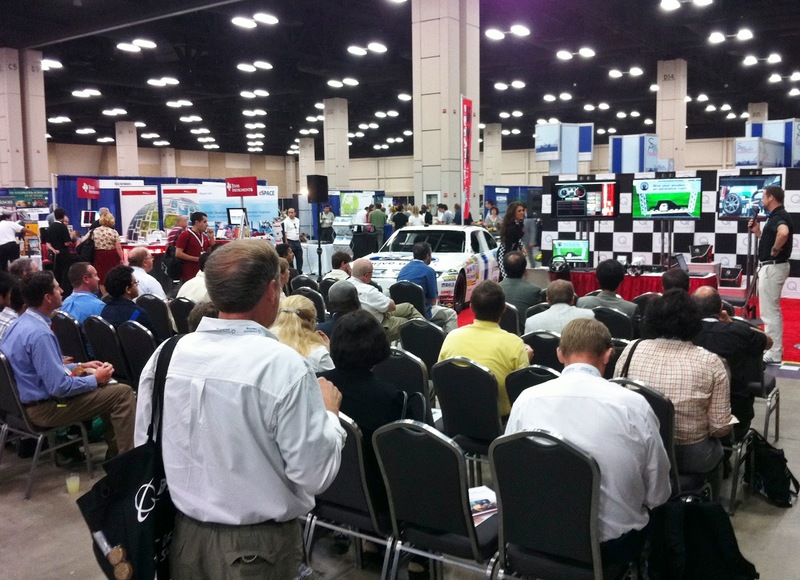 The Quanser Innovation Hub drew enthusiastic crowds through all three days of the conference. From a business perspective, what we experienced with the Innovation Hub is very much the kind of thing you do to help a company cross the chasm. Creatively reconfiguring abstract technology to one that intuitively connects with critical challenges that your constituents face. And the positive reaction we received from the audience definitely bodes well for the future. In our case, however, we actually had a double chasm to cross. I often remark about the chasms in the university curriculum where tradition has yet to catch up to modern reality. One of the biggest among such curricular chasms is the one between the high school experience and the first year university or freshman experience in undergraduate engineering. Various organizations have done a remarkable job in raising the awareness of engineering and other technical professions. If you look at the prevalence of robotics activities or technology-themed TV series, a generation of students who are leaving high school with energy and enthusiasm about a future career in engineering, we have an unprecedented opportunity as a society to nurture the next generation of leaders. Once they get onto campus however, all too many students are “welcomed” with an intense mix of classical mathematics, science, programming, along with generally dry and abstract treatments of the foundational techniques of engineering. Consequently, we have alarming dropout rates from engineering programs. In many ways, a large number of students fall off the freshman cliff and into the chasm. Academic Solutions Advisor Leor Grebler talks with one of the many attendees who dropped by the Quanser Booth in the Exhibit Hall. The QDS, from a pedagogical perspective, takes a bold step in helping students cross this particular chasm. Part of the story we told at the Innovation Hub was that of using strong applications properly integrated with real engineering hardware systems to truly motivate students. Not just in the control systems courses in their senior year but right into the freshman curriculum. “Let them do real engineering from day one!” is the message, and we at Quanser, believe that modern technology has all of the flexibility needed to bring advanced, hands-on enrichment to the freshman experience in a way that is motivating and conceptually reinforcing. Motivation can come from very emotional elements like fun and familiarity. In contrast, the same fun application also does a great job in introducing some very serious concepts in measurement, data analysis, modeling, and control. In this sense, fun and motivation are part of the framework that we can use to finally build a bridge across that curriculum chasm. I have been a part of countless conference exhibits in my career and I must say that the Quanser ASEE exhibits were the most enjoyable and fulfilling for me. As a business veteran of 25 years, I sensed that the company had reached some very significant milestones. As someone immersed in the education scene, and as a parent of teenage children, I sensed that some very important concepts have now been introduced to a broad audience and the hard work of discussing, refining, and deploying these great new ideas can now begin in collaboration with our academic partners. For a brief few days, I completely forgot about the Alamo in San Antonio, and San Antonio became the center of the education universe. As Chief Education Officer at Quanser, Tom Lee is focused on spearheading the development of Quanser's global academic community. He is closely involved with Quanser's technology and solution development process and the company's partner and alliance programs. He holds a PhD in Mechanical Engineering, and an MASc and BASc in Systems Design Engineering from the University of Waterloo. Geoffrey A. Moore, Crossing the Chasm: Marketing and Selling High-Tech Products to Mainstream Customers, Harper Collins, 2002.